If you can visit this stone circle, out of the holiday season, with no-one else around, you are far more likely to appreciate the atmosphere and spectacle of the place. 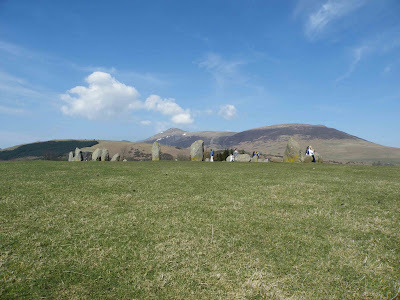 This is probably one of the UK's most beautifully situated stone circles, and is only about a mile East of Keswick, handily accessible just off the A66. Above. Photo of the circle looking North East towards Blencathra. Great Mell Fell can be seen at the far right of the photo. 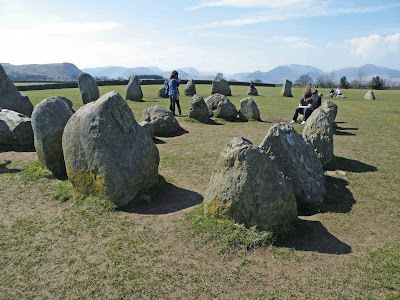 Castlerigg is an almost complete stone circle, with views out across the lakeland fells to all sides. In fact, the panoramic views of the lakeland fells contribute greatly to this particular circle. It isn't hidden away as some circles are, it isn't pressed up against a field wall, or hidden beneath dense undergrowth....but instead is open to all points of the compass with some of the best views of Blencathra to North, the Derwent Fells to the South West, Matterdale Common to the South East and Skiddaw to the North West. Above. Looking North towards Lonscale Fell. The circle consists of around 38 stones...possibly anything up to 42 if some of the smaller stones that are now poking through the eroded soil are counted. The heaviest stone is thought to weigh in at around sixteen tonnes whilst the tallest stone stands to nearly two and a half metres. 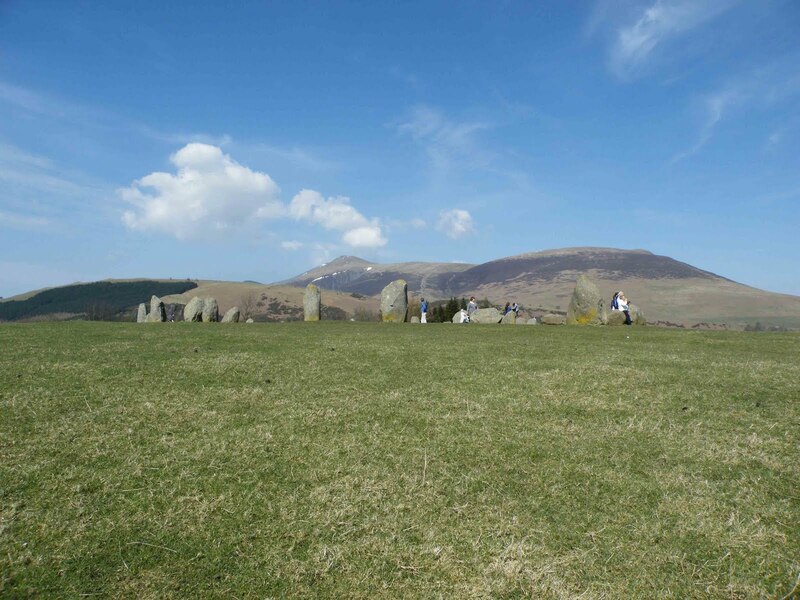 Castlerigg is actually a 'flattened' circle, and measures around thirty two and a half metres at its widest point, and twenty nine and a half metres at its narrowest point. Above. On my hands and knees looking North towards Lonscale Fell and Blencathra. Some estimates put the stone circle as being built around 3200BC, making it one of the earliest stone circles in the whole of the British Isles and possibly even the whole of Europe. To the South West of the circle, a lone stone, possibly rescued from beneath the surface of the field, has been erected against the field wall. It bears the scars of many years of plough damage, and indeed, aerial shots of the plateau that the circle sits on, show the familiar marks of ridge and furrow to the North and West of the stones. Above. A view of the small enclosure in the centre of the circle. The small enclosure, shown above, sits at the Eastern most part of the interior of the circle, and is sometimes referred to as the Sanctuary. It's not known exactly what this collection of twelve stones would have been for. The circle is open any time, and there is ample parking very near by. The walk from the roadside to the circle is only about a hundred yards, but may be very wet and muddy if it's been raining.